On the 5th of April, at 08:50 UT, the Moon meets the Sun in Aries, forming the New Moon. This New Moon is also the New Year’s day according to Vikram Samvat and Saka Samvat Indian calendars. This New Moon has much potential and much magic, but it’s not a very easy one and some effort on our part is necessary. The Sun squares Saturn and Pluto, both in Capricorn. Both squares will be active until after the Full Moon. Therefore, they’ll affect the whole period. Luck is not a force we should depend on. We need to work hard for good results. Also, our mood won’t be that good and stable. Continuously supporting ourselves and our mood is a wise tactic. Jupiter is turning into retrograde motion during this waxing Moon, as well. It will turn retrograde on the 10th of April, at 17:01 UT and it will remain in retrograde motion until the 11th of August. Until now, 2019 has blessed us with considerably long periods of only-direct planetary motions, but from the 10th of April onwards, at least one planet, and from 24 April at least two planets, will be in retrograde motion until the end of the year. Furthermore, Venus from Pisces squares Jupiter in Sagittarius. This square will become accurate on the 15th of April, but it will be active from the 8th of April until the 24th. Arts, health, money, and love need some extra care, extra effort, and extra attention. Mercury, too squares Jupiter, accurately on the 12th, but this square is active the whole waxing period. Thankfully, though, things are not that dire. The two Lucky Stars, the Sun and Jupiter are in a triangle. This will be accurate on the 14th of April, but the triangle starts acting from the day of the New Moon and it will remain active until the 24th. That’s why luck and success can come. Yes, after effort, but they can be great, nonetheless. Also, both Mercury and Venus support both Pluto and Saturn, reducing their stress and encouraging their good sides. Mercury already supports Saturn, via a hexagon, which will remain active until the eve of the Full Moon, just after Mercury will have entered Aries. It also supports Pluto via a hexagon. This hexagon, too, is already active and it will remain active until the 19th, the day of the Full Moon. Amongst else, these hexagons promise that we can heal the fields of our lives Saturn and Pluto stress and that both magic and meditation can become very, very effective during the whole period of the waxing Moon. Don’t miss the chance to use both of them at the fullest, during this waxing Moon, as after the Full Moon Pluto will be turning retrograde, too. Venus, on the day of this New Moon, starts supporting Saturn via a hexagon, and this hexagon will remain active until the 21st, just after Venus will have entered Aries. Similarly, it supports Pluto via a hexagon. This will be active from the 7th of April onwards and until the 23rd, while it will become accurate on the 14th. Therefore, health needs attention, but healing is strong. Beautification, magical and non-magical, is also strong. Love life can meet some challenges, but overcoming them will make our love life much better. Arts also meet some challenges, but inspiration and productivity can become great if we put some effort into them. Last but not least, Pluto’s and Saturn’s conjunction, which has been active since December 2018, now is almost as good as accurate. In actuality, although the aspect won’t be accurate until January 2020, it does affect the whole year, and during this waxing Moon period, significantly more so. Progressing in the occult is strong. Strengthening love relationships for Taurus, Cancer, and Virgo is also strong. Bettering work and career for Gemini, Cancer, and Leo, too. Initiations and progress in spiritual and energy healing are auspicious. And these are just some of the benefits this almost perfect conjunction blesses us with. In the same time, though, it encourages our pessimism and our focus in the negatives, death, and futileness. These we should fight. 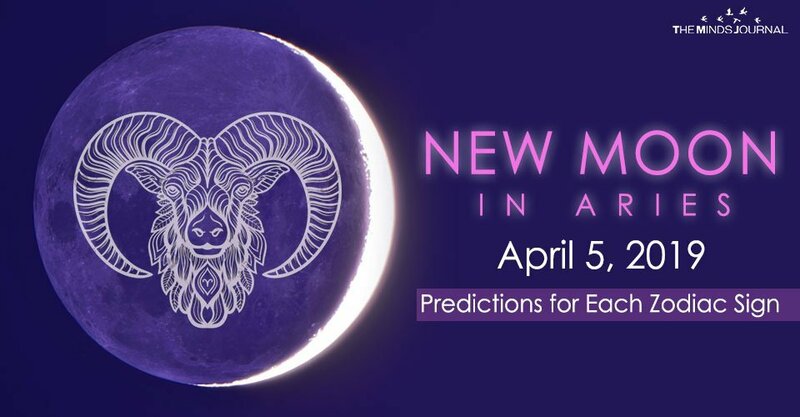 This New Moon happens in your zodiac and affects you greatly, both beneficially so and stressfully so. Your optimism and self-discipline are probably lacking and, therefore, the “world” can distract you and discourage you, relatively easily. Do your best to avoid those. If you do manage to control or avoid, these negative sides, most things can go nicely, during this waxing Moon period. Work and career matters that have been stressing you – and maybe they’ll stress you even more, during this period – are no exception to this. You can take the right decisions. Just decide calmly and don’t let your fear or stubbornness become your guides. Starting a new business can be harder, but not really inauspicious. Changing schools and jobs, on the other hand, becomes easier and, if we can say this for this period, luckier. Your inner self is probably your worst enemy, under the influences of this New Moon and this waxing Moon period. Do not fight your inner self, though. Become friends, instead. Encourage and motivate yourself and let yourself encourage and motivate you. Listen to your needs and desires and work on them. Do not focus on what you don’t have, or what you can’t do, right now. Instead, keep on thinking about what you can do, under the current circumstances and do your best. For one thing, your magical and spiritual powers are exceptionally strong. Therefore, they can become a good ally. Also, there are some good influences on traveling, working with people from other places and countries and trade. Artists can find inspiration and overcome blocks by researching and studying other artists of the same art.